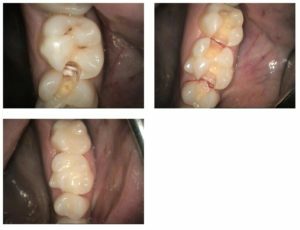 Here is a recent case completed by Dr. Swain, showing some cavities between and on the biting surfaces of some molar teeth. The first photo shows the dark, soft cavities. The second photo shows the teeth after the cavities have been removed. The final photo shows the teeth after they were fixed with the new composite fillings. Fortunately these teeth were able to be fixed this way before extensive treatment was necessary.